Yahoo is for sale, and bidders are lining up to grab their own, ever-shrinking piece of Internet history. The once-great Internet pioneer is entertaining offers...reluctantly. CEO Marissa Mayer would like to see Yahoo through its struggles, but impatient investors are looking for a way to cash out. 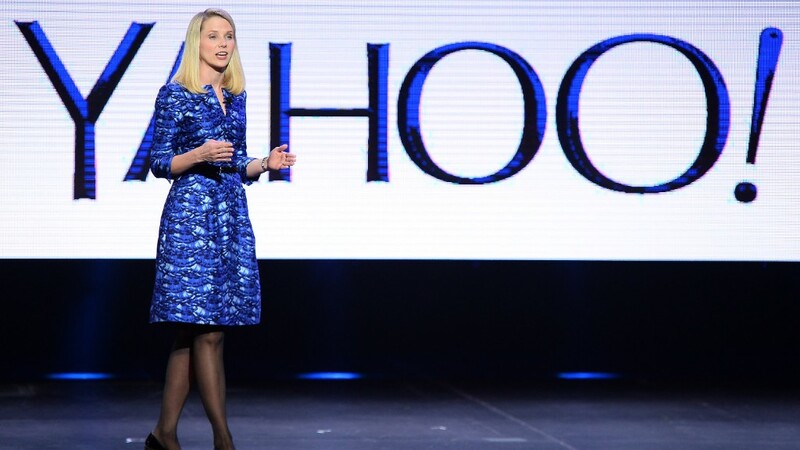 Yahoo (YHOO) has reportedly given interested parties until April 18 to make their offers. The company is expected to fetch something like $8 billion for its core Internet business. The list of interested parties matches the potpourri of businesses that Yahoo operates. Media companies, such as the Daily Mail and Time Inc. (TIME), are reportedly thinking of making an offer. A Daily Mail spokesman confirmed to CNNMoney that the company is looking at bidding for Yahoo. Technology companies, such as Google (GOOGL) and Microsoft (MSFT), are also reportedly looking into bidding for other pieces. Though Google isn't likely to make an offer, due to antitrust concerns, Microsoft would like to preserve its relationship with Yahoo, providing Bing search results for some search queries. Microsoft had made a $45 billion offer for Yahoo in 2008, which Yahoo successfully fought off. Verizon (VZ) could also be a player. It owns Yahoo rival AOL and other media assets, and the company has publicly expressed interest in taking a look at Yahoo. AOL is like a mini version of Yahoo, with a sizable digital advertising and online content business. Verizon bought AOL last year for more than $4 billion. Private equity firms General Atlantic, TPG and KKR are also widely reported to be considering buying Yahoo. After April 18, Yahoo will decide whether it likes any of the offers it received. It could enter into an agreement with a potential buyer, or it could turn down all the offers. If Yahoo enters into a purchase agreement, it will likely be a complicated deal that could take a long time to complete. Yahoo has stakes in Chinese e-commerce company Alibaba (BABA) and Yahoo Japan, which likely won't be part of the sale. Yahoo has been trying to unload Alibaba through a complex reverse-spinoff for months. If Yahoo doesn't sell itself, it could begin a nasty battle with activist hedge fund Starboard Value, which has said it would nominate an entirely new slate of directors at Yahoo's upcoming shareholder's meeting later this spring. What will happen to Marissa Mayer? Either way, Mayer is probably toast. Mayer has led the fight to keep Yahoo on its current path, butting heads with Starboard and other investors pushing for a sale. She'll almost certainly be ousted, regardless of the outcome. If Mayer is fired as a result of a sale, she could get a golden parachute exit package worth about $37 million. If Yahoo isn't sold, and she's given the boot, she would take home about $12.5 million. How did Yahoo get here? At its peak in early 2000, Yahoo was worth $255 billion. Yahoo never really recovered from the dot-com bust. After a series of missteps, bad bets and six CEOs over the past nine years, Yahoo is now valued at $34 billion. But that $34 billion is roughly the value of its stake in its Asian holdings. In other words, the stock market is valuing Yahoo's core Internet business as completely worthless. After a promising start as CEO in 2012, Mayer's free spending on talent, executives and questionable assets like Tumblr -- yielding few positive results -- have landed her in the hot seat. Mayer has been unable to grow the company's profit. Yahoo unveiled a new strategy in February, cutting staff and focusing on its most crucial businesses. But it appears to be too little, too late.